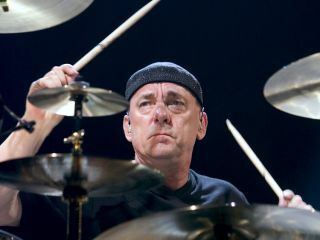 Love Rush's Neil Peart? Love hockey? Then you're bound to be in hog heaven, as the Canadian sticksman and hockey enthusiast has rewritten The Hockey Theme. The tune, which has been used to open Hockey Night In Canada telecasts, got a rock makeover by Peart, and you know what that means: lots and lots of drums, more than most humans can handle. And if you're not a hockey fan but you're just mad about all things Neil Peart and Rush, you're still in luck: the song will be available for download on iTunes tomorrow, 19 January. "Growing up in Southern Ontario in the '50s and '60s as 'a kid who couldn't skate right' was a serious handicap," said Peart. "Hockey totally dominated our lives for half the year - Sunday nights with my dad at the St. Catharine's Arena cheering on the Junior A Blackhawks, anxiously watching NHL games on television, arguing in the schoolyard over favorite teams and players, trading hockey cards, putting them on our bicycle spokes, and playing on backyard rinks and frozen ponds, on the street, and on those old tabletop games. Hockey ruled. "So, all these years later, being invited to create a new version of 'Canada's second national anthem' for TSN's NHL broadcasts was a huge honor to me, and an exciting musical challenge. The day of recording and filming it - in the presence of the Stanley Cup - was truly one of the great experiences of my life."